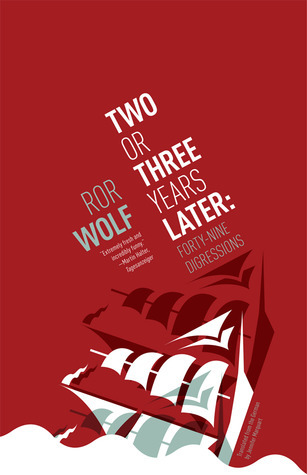 GoodReads Giveaway for "Two or Three Years Later"
bq, Working in the traditions of Robert Walser, Robert Pinget, and Laurence Sterne, Ror Wolf creates strangely entertaining and condensed stories that call into question the very nature of what makes a story a story. Almost an anti-book, Two or Three Years Later: Forty-Nine Digressions takes as its basis the small, diurnal details of life, transforming these oft-overlooked ordinary experiences of nondescript people in small German villages into artistic meditations on ambiguity, repetition, and narrative. Incredibly funny and playful, Two or Three Years Later is unlike anything you’ve ever read—from German or any other language. These stories of men observing other men, of men who may or may not have been wearing a hat on a particular Monday (or was it Tuesday? ), are delightful word-puzzles that are both intriguing and enjoyable. You can read an excerpt here and you can click below to enter the drawing.